Combine fruit and nuts. Mix OJ, yogurt and honey and fold into fruit mixture. Chicken Salad (not a recipe, but what I do): Pull meat from a Rotisserie Chicken and chop. Cut up a few celery sticks and pulverize in the food processor. Toast some slivered almonds. 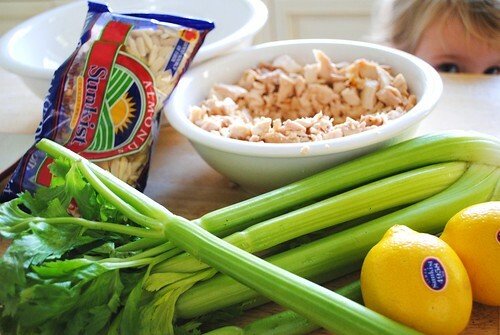 Combine chicken, celery, and nuts with salt and pepper. Make a hole in middle of chicken mixture and put a dollop of mayo much smaller than you think you need. Squeeze a lemon into the mayo and stir. Finally, stir all that chicken into the mayo, and maybe add a small dollop more if it isn’t sticking together. Scones: I blogged the recipe here. Now, the blog for today 🙂 Sometime this summer, I learned one of the major negatives of anonymity (Try to say that three times in a row, fast. I can’t even say it once, now that I’ve been trying to figure out how to spell it.). I got a letter in the mail that was addressed to me and had the return address of the house I grew up in. I thought it was from one of my sisters at first and found it strange that they’d typed me a letter and cut it out all funky. It began, “Greetings from Dothan b! *%h.” I thought, “Wow, somebody’s feeling kinda spunky!” As I read on, I quickly realized that it was NOT one of my sisters, but instead some anonymous person who, apparently, hates me. It was, quite possibly, the most ridiculous thing I have ever read, and Jeremiah and I have both laughed until we’ve cried about the things this person thinks of me. I can, at least, take comfort in the fact that they know me not at all if they were trying to hurt my feelings by the things they said. I have plenty of insecurities, but this person did not hit on one of them. I am almost tempted to type it here so that you can all laugh with me, but somehow, I’m afraid that might give my quasi-stalker some satisfaction–and that I do not intend to do. What in the world?!!! How absolutely, marvelously, sweet was that??!!! I called a bunch of people I thought might be suspects, but none of them were the doers of the good deed. It’s just wondrously anonymous…I don’t do things like that, do you? It’s sad to admit, but I like to see people’s reaction when I do something nice…which, I don’t know that I’ve ever done anything that nice. My Dad said he thought it was God sending me gas money for making the effort to come down for Caroline’s shower. I think it was God sending me the money for that tea-set 🙂 I don’t know, but I certainly am so thankful, and the bursts of happiness it has given me over the past week, have made me want to do the same thing for somebody else. Saying all that, I’ve decided that I want to allow people to comment anonymously on this blog again. I know there will be some bad parts to that, but I’ve seen there’s some good in it too. I really miss some of you faithful anonymous commentors from way-back-when. And, if you feel the need to tell me something mean, I’d much rather you go ahead and post it here, than send it to my real mailbox (which is kind of creepy). Hooray for sweet anonymous people!!!!!!!!!! Abby, For some reason, I feel led to give you this scripture and also from my Amplified Bible so it's sort of wordy. It comes from II Timothy 1:7. For God did not give us a spirit of timidity–of cowardice, of craven and cringing and fawning fear–but [He has given us a spirit] of power and of love and of calm and well-balanced mind and discipline and self-control. I am sorry that you received such a letter but there will always be people out there that use words to try to hurt us. I'm saying a special prayer for you! I so enjoy your blog. Thanks for sharing your life with us! It is such a testimony of God's goodness! Oh,and congrats on the surprise envelope! God is good all the time! I'm a blog reader from Mobile! Let me just say I am so so sorry that someone could attempt to be so cruel! I'm in my mid 20's and pregnant with my first baby. Like you I have longed to be a mother my whole life. Your blog is such an inspiration to me, let your light sine on Abby!!!! Abby- who would ever send you a letter like that? That's the craziest thing I've ever heard. I, too, want to thank you for sharing your life with us. It is obvious that the peace of Christ abides in you. You handled the letter debacle with such grace & humor…two wonderful qualities! I just had to pick my jaw up off the ground. I will pray for you and the person who sent that letter. A sad person to do something so ridiculous. You are precious Abby… I enjoy your blog very much. Thanks for sharing from your heart! p.s. you inspired me to shine up my tea set. It was sad, forlorn, and all tarnished. After I read about your excitement, I felt so guilty not taking care of something I had been blessed with. Thank you for reminding me. And resident wife to resident wife – money in an envelope is the coolest thing I could think of!!! Just thought it'd be fun to be the first one. i love your blog and your transparency. 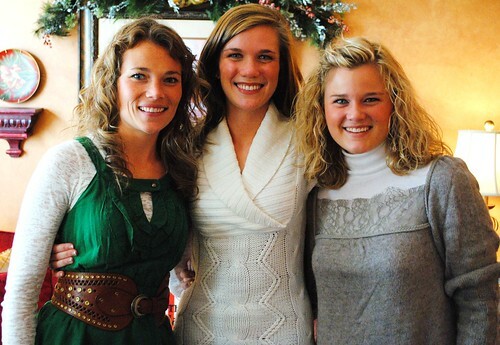 your sistas are gorgeous … i love seeing pics of all of you together … reminds me of mine. whoever thought to send you that note is just jealous of the person you are. way to rise above. I'm one of those commenters from way-back-when, but I do always leave my name and since I'm a blogger myself, I'm certain my pic appears too. I love your blog and the way you so honestly write and I truly cannot fathom someone being so hurtful to someone else. I found your blog through some mutual friends I believe we have in the Dothan area and have been reading for some time. I have three little ones and I just get so much comfort out of other moms, like yourself, that appear to be so real and transparent. I don't like change much either, but I guess I adapt well and I always feel like God puts us just where we need to be. Our family blog is private, but I'd love to get your email and link you in if you're interested? I look forward to keeping up with you all as you make this next transition in your lives. I feel certain it will be wonderful. I am very thankful that you came down to my shower and it will be something I will never forget. I have been a blog lurker for a while and wanted to say hello. I went to Samford with Jeremiah and stumbled across your blog from the Whitson's. I enjoy reading your stories, and with two little girls of my own, can relate to most of them quite well. Keep up the good work. You are a special person. Please tell Jeremiah that Ellen Bell and John Hamrick say hello. I really didn't like reading about that mean-spirted human– living in Dothan! I miss Dothan for other reasons! I love the people down that way, and their joy for life! I doubt that person who sent that evil letter to you lives in Dothan! When your light shines so bright, as your does…I guess those who are living in the darkness are blinded by it? Why would anyone take the time to be so hateful? I have to remember this, dear…Hurting people…hurt people! I am so sorry that you even had to open it! I am happy that you were able to roll it off your back! Abby, you are soooo precious and loving. I enjoy reading your words of wisdom, truth, and love. Keep up the good work and who ever wrote that…Well…we will just pray for him, or her! God is good and loving, and forgiving is what we are all called to do! Make it a blessed and great week! P.S. I forgot to share…I once…found a $ 20.00 bill in a parking lot! I am always finding change on the ground. I think…It's $$$ sent down from heaven via my Dad! I found so many coins one year while walking our dogs. It was my B'day and I knew Dad was smiling down! Hmm well it is a reminder that all sorts of people read what you leave here on the internet. I say leave here because it is here –is there a way to make it go away I don't think so. Also, the return address was what ever What was the post mark ? where was it mailed from?? you could have a letter traced … the postal service encodes the mail with bar codes for ease of tracing a letter so edward sissor hands beware!